Dream Pod 9: Utopia Kickstarter Update: Support Armiger, Recce Armiger, & Commando Drones Mold Plates 3d Models Preview! Last week we received three of the Utopia robot mold plate 3d models to approve and get their production started. 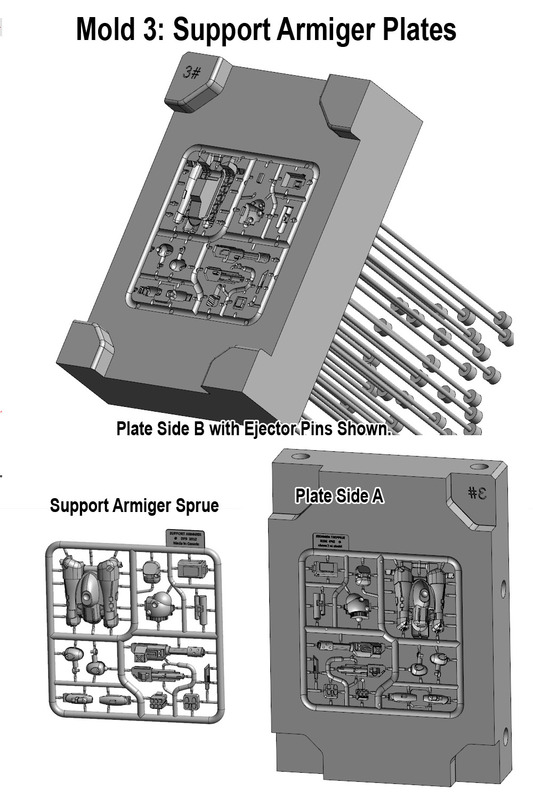 Below we have preview images of the Support Armiger, Recce Armiger, and Commando Drones mold plates to checkout. 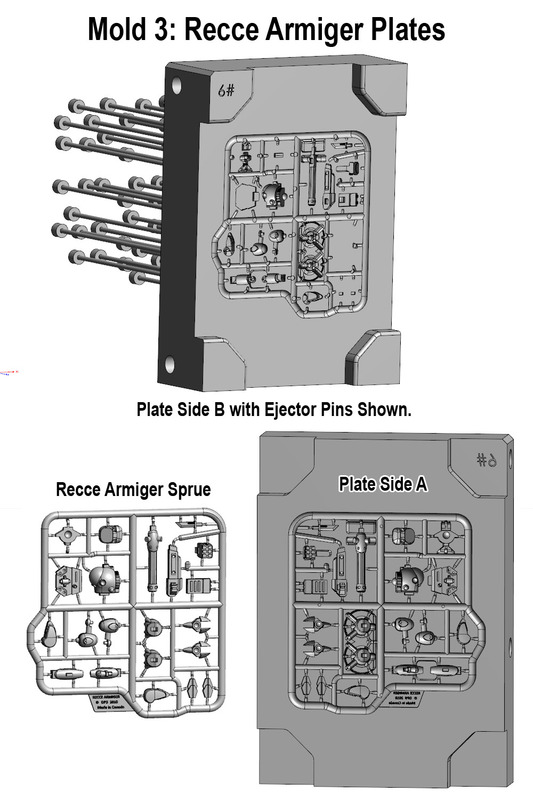 Each preview image includes views of the Side A Plate, Side B Plate with the ejector pins showing, and the plastic robot sprue(s) they make. We are behind schedule on the Kickstarter and the originally planed April 2019 shipping date will need to be pushed back to this summer. As we expect the mold production to take another month. Then test pops of plastic robot sprues will be made and sent to us to approve the molds or note problems that need to be fixed and new test pops make and shipped us to check until the mold are good and approved. We expect the test pops and final mold approval to take another month, based on experience from our first Kickstarter. Shipping of the Utopia, Peace River, and NuCoal molds from China to Montreal takes another month. And then our local Canadian plastics manufacturer will need another few weeks to prepare the molds and get all the plastic robot sprues popped and deliver to our office. We hope to receive them late July, and start packing and shipping backer reward packages shortly after. 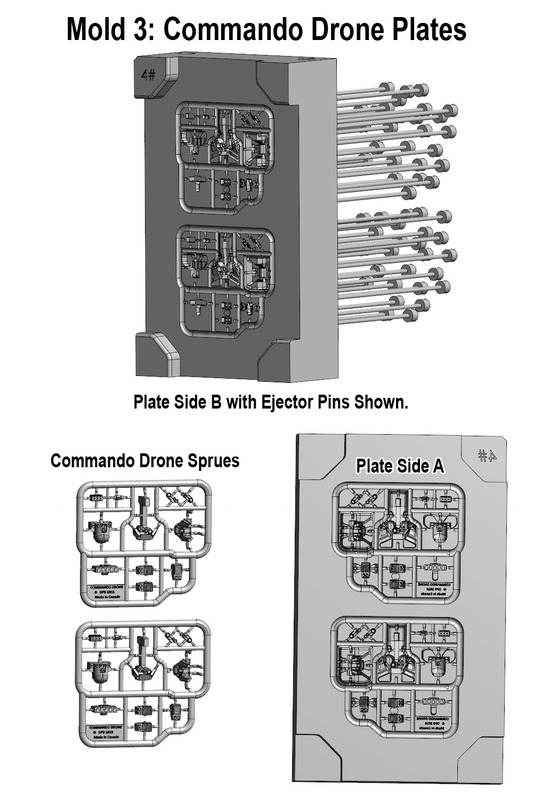 Home › Blogs › Robert Dubois's blog › Utopia Kickstarter Update: Support Armiger, Recce Armiger, & Commando Drones Mold Plates 3d Models Preview!